Location: Adjacent to the Iron Skillet Restaurant parking lot behind the post office. Status: The Log House is owned and maintained by the EBHPS. 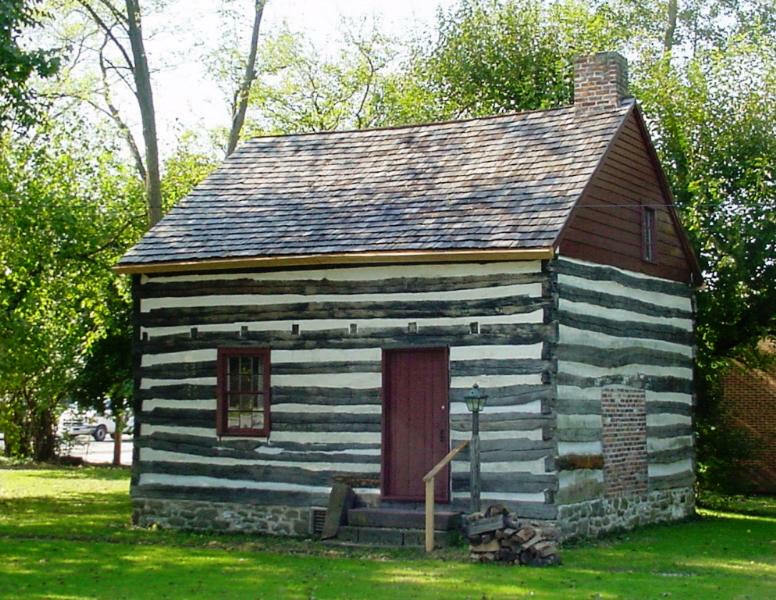 This two-room 1832 log structure once known as Meyers Log Cabin, was once home to a family of eleven near Red Hill, Berwick Township near Cross Keys, Adams County. Although eventually electrified, the house never had running water or other indoor plumbing. Thirty volunteer members of EBHPS spent 350 man-house in 1980-1981 disassembling, moving, and reconstructing the house in East Berlin. The 21' by 23' building features V-notched logs up to the weatherboard gable ends of the second floor. Hand cut nails and spikes fasten doors, window frames and floor-boards. Joists and cross beams are fastened with wooden pegs. The stone and brick fireplace was the only source of heat in early times, but a wood stove manufactured by the East Berlin Foundry has also found space in the reconstruction. The log house welcomes groups of children and visitors as part of its Education program and provides an ideal setting for hearth cooking and learning about everyday life in early times, especially in such "close quarters."